not to mention protic solvents potentiate decarb. so using a protic solvent on acidic cannabinoids just wastes some fraction of your yield. throw some pure THCA into a vial with ethanol and test daily samples via LC, youll see it. I guess. Though generally we don’t give that term to other methods of crystallization which include more than one solvent. Most cbd isolate would fall under the category of “two solvent crystals” at that rate, considering CBD is rarely extracted with the same solvent used for reX. I would just say its THCA recrystallized in a secondary solvent. If anything “two solvent crystals” sounds more apt for crystals made by playing with solubility in a two solvent system, which can also be fun. Interesting. Definitely good to note. I only included that part of the description because I think that level of particulate filtration contributed to the formation of larger crystal structures, versus just some multiphasic THCA micro-crystal sludge that I’ve seen in winterized BHO that has sat around. I came across this thread, and it looks like it would fit my process perfectly. Could anyone provide an update if you’ve been successfully getting crystal formation with etoh? How would you rate the viscosity? You need it to be in the vicinity of maple syrup. Check out @washingtonhash710 on IG. Looks like they make THCa crystals and sauce from EHO using a vacuum oven and a Pyrex dish. I assume that a controlled slow evap could crystallize. I’ve also seen @THChemist here do Pyrex dish crystallization of thca in ethanol. Seen him post some awesome dishes on Instagram. Thanks for the replies. 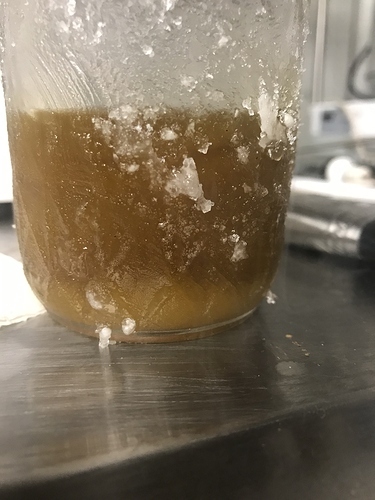 This is my 1st time trying to make crystals/sauce. I did an experiment making Blue City Diesel 4 ways. 2 ways made in to shatter so I could try out my new oven. The other 2, I put back in to jars. Both jars went in to a cooler in a dry ice/iso bath. After about a week, I started to see a very small white layer on the bottom. The whole solution was the consistency of syrup. On one of the jars, I replaced the lid with a coffee filter and screwed the ring back on. That jar is going to evaporate at ambient temp on the shelf in the garage, currently about 35 degrees out. On the other jar, I left the lid on, loosened the ring, and put in to a 90 dog oven with the shatter run. I’m hoping the warm temp will help with crystal growth, and the loose lid will allow evap. My only observation with this method so far is how long it took for the solution to start separating. I’m wondering if a different solvent would have sped up that part of the process. Has anybody tried to force a crash in etoh before starting evap? Any ideas on what I could do differently next time? I’m tempted to dry out some acetone and do the same test to compare. This is a pic of the small separation after a week. That looks great! Does THChemist have that tek posted on here? I wish. I sure he operates under some sort of NDA. But he’s shown it’s possible. Just need to figure his technique out. They guy i posted about doesn’t describe his method but you can kind of pick it up through the pics to a certain extent. When I was getting crystals it was by accident in water contaminated alcohol. I wonder if a few drops of water would help the crystals crash out of your alcohol @Blindsay?